The morning panels went from showing that there are still new angles to be found in the classical and ever-lasting debate of Institutional vs. Ad hoc Arbitration, to discussing the potential of blockchain technology in arbitration and the use of arbitration in blockchain transactions. The morning session was concluded by a presentation of the Nordic Offshore & Maritime Arbitration Association Rules. The afternoon went in the blink of an eye in the light of engaging discussions on Due Process in Arbitration and Mandatory Mediation Before Arbitration. 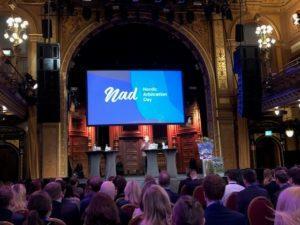 Finally, the NAD’s Soap Box Debate presented a fresh look at the shared history of the Nordic countries and how that might affect arbitration proceedings. Despite the gravity of the topics, the atmosphere was relaxed yet energetic and benevolent. The discussions transitioned into the evening reception as all of the panels received more questions from the audience than the time constraints allowed to answer. Joint effort. The conference was co-hosted by young arbitration associations in the Nordic region: Young Arbitrators Copenhagen, Young Arbitration Club Finland, Young Arbitrators Sweden, Young Arbitration Practitioners Norway, and Iceland. Apart from bringing together Nordic professionals passionate about arbitration, the event already showed the product of collaboration in the sphere – the Nordic Offshore & Maritime Arbitration Association Rules. Diversity. Nordic arbitration community is a diverse group of professionals, as reflected in conference participants, and panel compositions. Even the pitfalls of using artificial intelligence to advance diversity in arbitration did not escape the scrutiny of young professionals at the event. To be continued. The pilot event proved to be a success. The next Nordic Arbitration Day will be held in Denmark in 2020. The conference instills confidence in the future growing cooperation of the Nordic countries in the field of dispute resolution.